"Dammit" Janet, as her call name suggests, has a little of the devil in her, typical of all her female line. Her mother, Mabel, Ch Norwester Golden Bay Babe, was an enthusiastic and successful show dog, and Janet has inherited her outgoing attitude. At her first appearance in the ring at 3 and a half months old, at the North Canty. KA show on 2nd Jan 2013, she was Baby Puppy in Group, under local judge Pat Plimmer. At her second and third shows, Banks Peninsula A&P, Janet was Baby Puppy in Group both days, under local judges Karen McIntyre and Brian Harris, then went on both days to be Baby Puppy in Show under John Forbes and Robin Robertson of NSW. At Nelson District KA next weekend she was beaten by her litter brother, who went BPIS day one and BPIG day two. However, Janet was 5th of 57 entries in the all age Puppy Stakes. 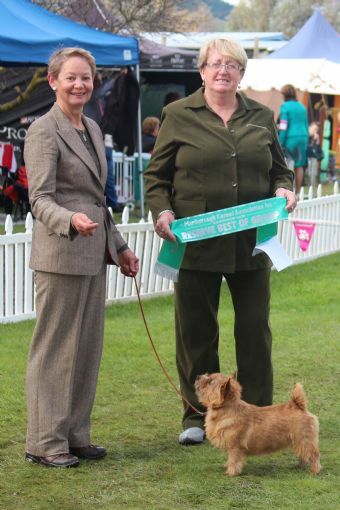 At the CKA Open Show 3rd Feb Janet went BIG and BPIS, also taking out the all age Puppy Stakes under terrier breeder-judge Samantha Diggins (nee Cowie) of Wellington. Only entered the first day of the Waikouaiti KA show, a double show on 16th Feb, Janet was Baby Puppy in Group in each show, under judges from Mexico and Paraguay. 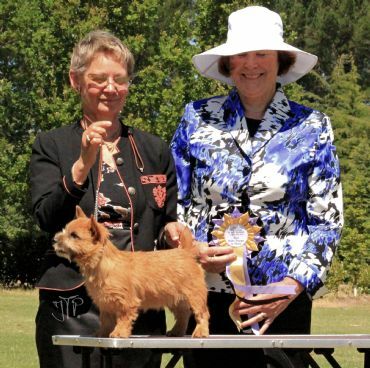 At Canty Ladies 2nd March, Janet was Baby in Group under B. Hession (Aust), 3rd in the Baby Puppy Stakes under Jan Brownlie of Dunedin, and Baby Puppy in Group and Baby Puppy In Show under K. Eldred (Aust). She was BPIG under B. Hession at the North Otago KA show on 9th March. As a baby puppy she had a total of 8 Baby Puppy in Groups, 3 of which progressed to Baby Puppy in Show. Puppy in Group under Peter Martin, Australia at Selwyn District on 24th March,4th place in Puppy Stakes at North Canterbury at Easter (Rick Berwick). Janet was Runner Up in Puppy Stakes at Ellesmere A&P under Rhys Dwyer. At Marlborough, she was Reserve In Group under Debra Howell, a great thrill in such strong competition. 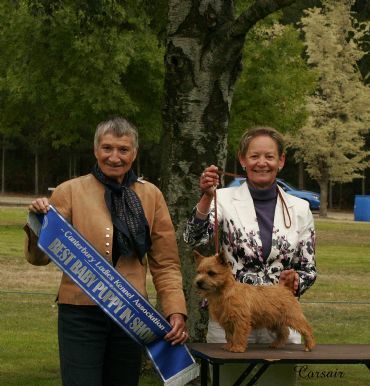 Janet was points table Baby Puppy of the Year 2012-2013 Canty Combined Terrier Club, and Junior of the Year 2013-2014. 3-Mar-13 Best of Breed, Baby Puppy in Show.